Whisk all the wet ingredients to fully combine. In a separate bowl, combine all the dry ingredients. Add wet ingredients to dry and fold to combine. Scoop into a lined 12 cup muffin pan 3/4 full. Insert cream cheese cube into the center. Bake for 20 to 25 minutes or until muffins are baked and golden color. Remove from oven and glaze with orange marmalade. Just the combination of marmalade and cream cheese has sold me on this recipe. Great post and tasty pictures-thanks. Thank you ladies! This is a favorite combination of mine. You must try. Hi Mia! I clicked over from FB and I love your site! So clean and fresh. 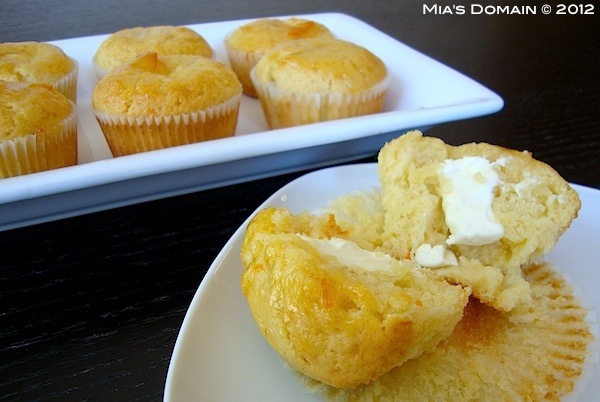 These muffins look so perfect and the best part is I have everything I need to make it! So glad you enjoyed the muffins. Thank you so much!! What a wonderful pairing of flavours! I'll be sharing a link to this post on my FB page tomorrow. Thanks.